A military test accidentally sends a modern-day army back in time to feudal Japan. When their actions in the past begin to have an effect on the present, another unit is dispatched to retrieve them. But the commander of the lost unit has other plans: He wants to use his advanced technology to conquer Japan and change his country's destiny. 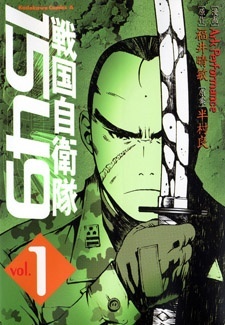 Sengoku Jieitai 1549 was published in English as Samurai Commando: Mission 1549 by CMX Manga from July 11, 2007 to October 31, 2007.